We provide advisory, training, and facilitative consulting services related to project, program, portfolio, and PMO management. Our expertise spans agile, traditional waterfall, and hybrid approaches. While every engagement is unique, business outcomes typically include getting more projects done, faster delivery and time-to-market, improved on-budget performance, better management of risks, improved customer and stakeholder satisfaction, and more consistent realization of business results. 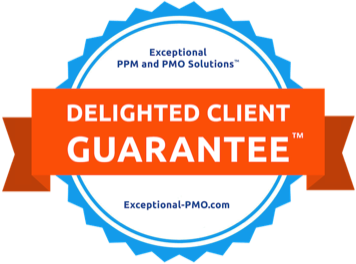 Exceptional PPM and PMO Solutions™ has a Delighted Client Guarantee™. Our proven approach organizes projects into manageable deliverables with success criteria. When our clients are delighted with the results, we get paid. Visit our verified business profile at Inc.. Discover our Produce Planning Cards™ for agile teams. Connect with us on social — like us on Facebook and follow us on Twitter and LinkedIn. We work confidentially and are committed to integrity, innovation and high quality with exceptional outcomes. Contact us.